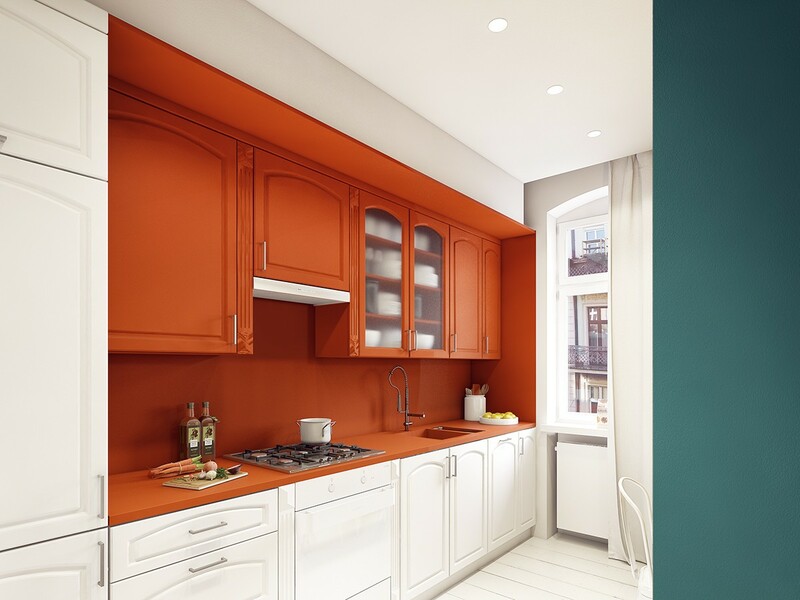 You've got just one wall on which to set a run of kitchen cabinets… doesn’t really set the creative juices flowing - or does it? 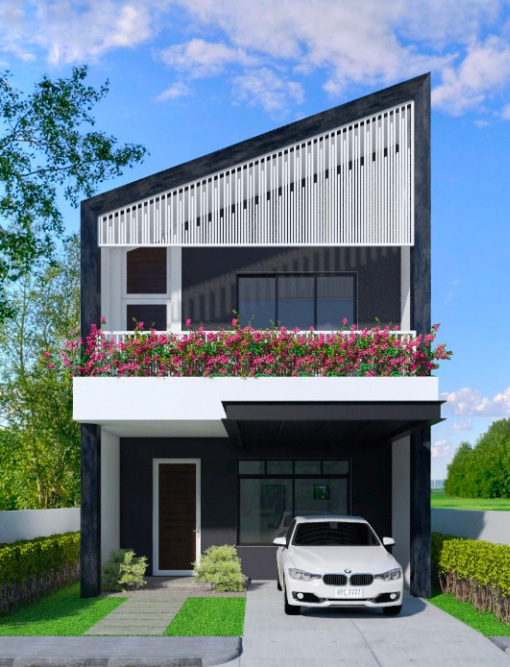 One wall kitchen designs often require us to get even more creative with our space to ensure that every culinary need is met in an arrangement that suits our personal style. 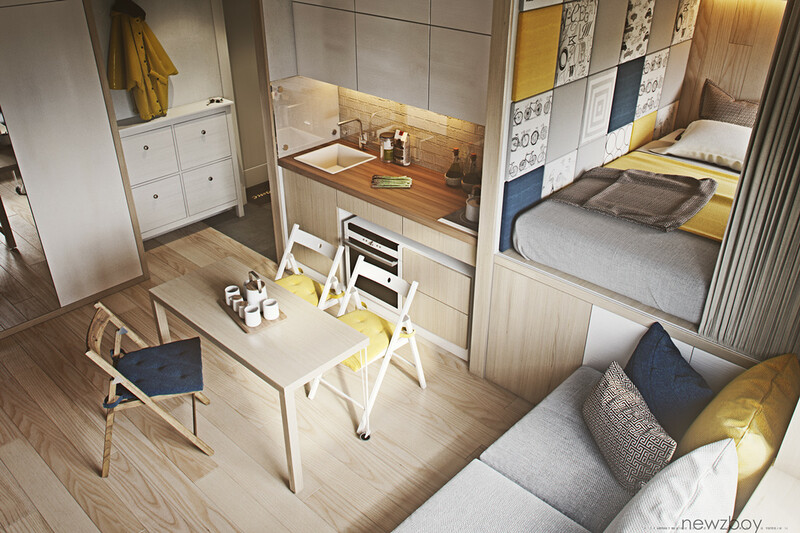 The one wall kitchens in this collection each bring a unique flavour to the table and explore different layouts. 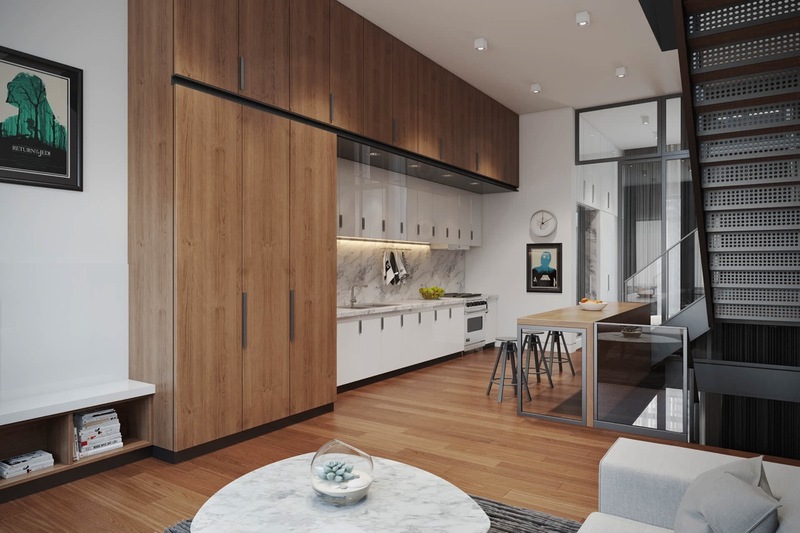 Yes we did say layouts, because even though these kitchen ideas follow a straight run, there are multiple ways in which to situate appliances and accessories, plus accompanying kitchen islands and dining areas. 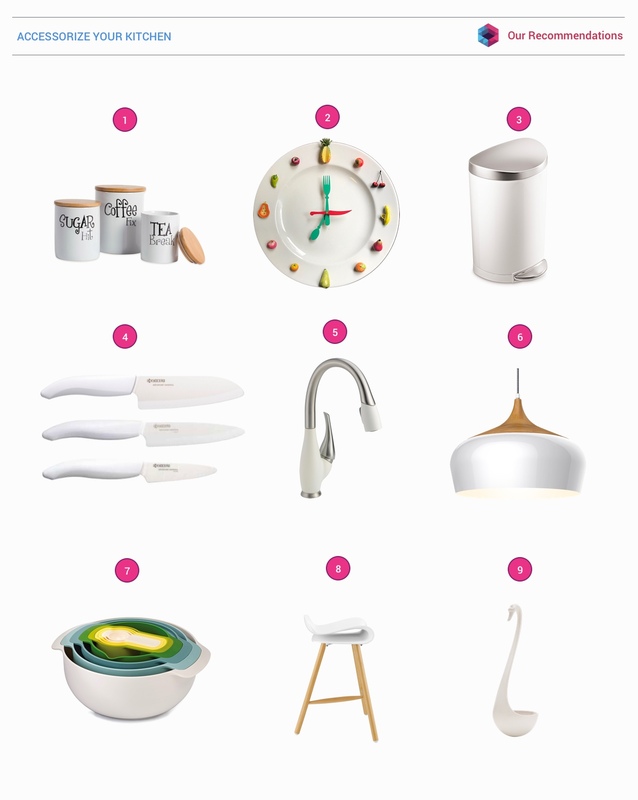 Mirror, mirror on the wall, who’s the fairest kitchen of all? Two mirror fronted cooking appliances are wall mounted above the counter in this single wall kitchen. Their reflective surface helps the large items to blend with a white wall. 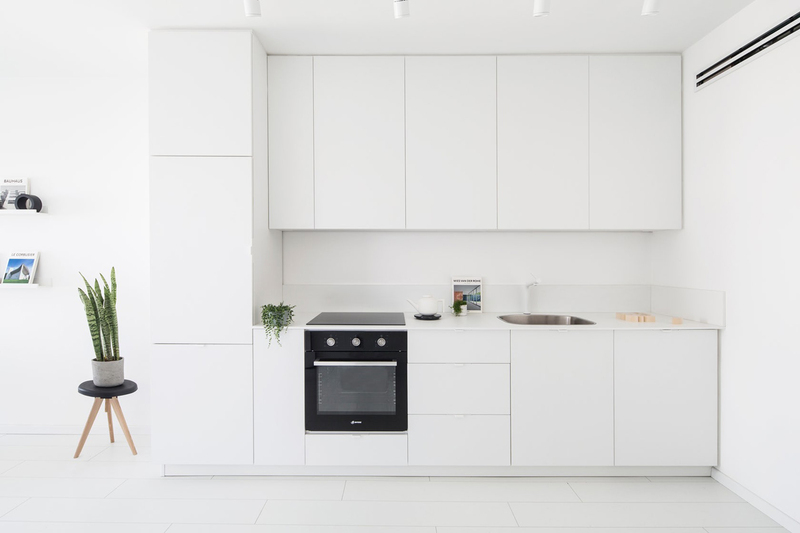 A single wall shelf runs the remaining length of the kitchen, with a track on its underside on which to hook a kitchen roll holder, a knife block and other kitchen accessories. The shelf itself is dressed with a considered collection of decorative items and cook books. 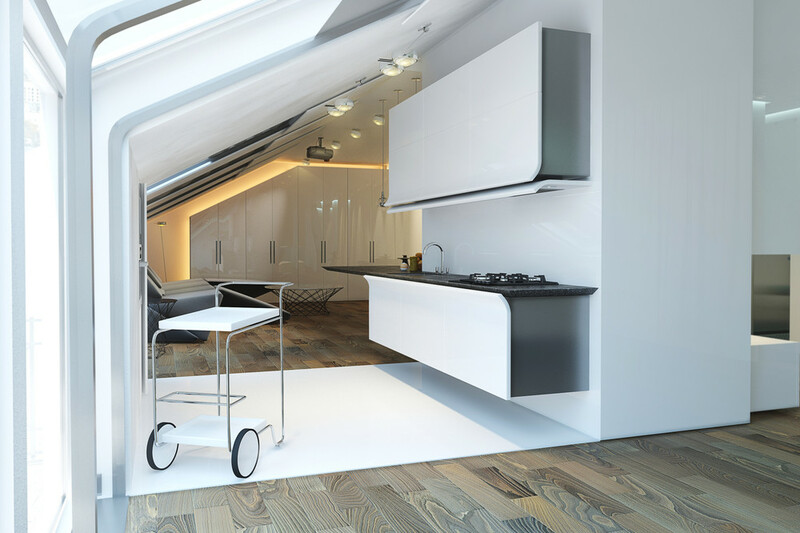 A kitchen extractor unit is set flush into the ceiling above the stove to keep the look open and airy. Chalk it up to experience. 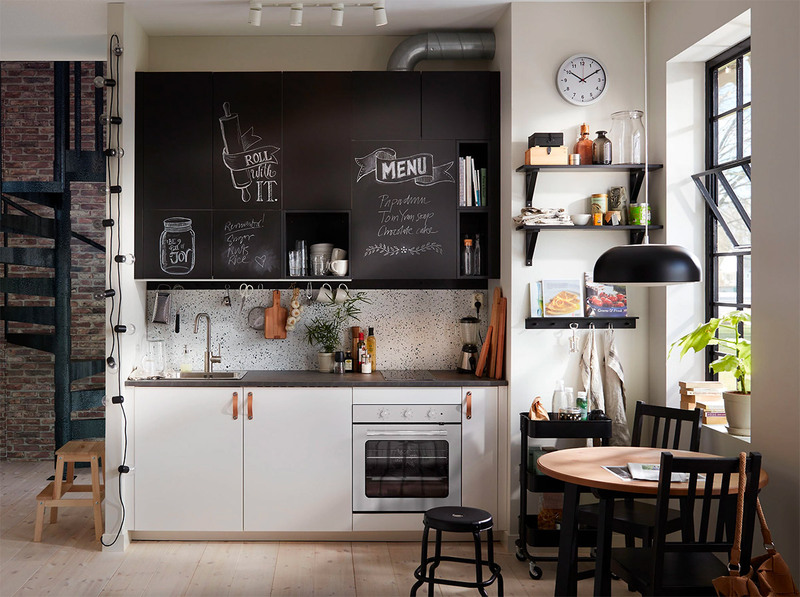 A previous bad choice of wall cabinets can be given an easy fix with a lick of chalkboard paint or some chalkboard vinyl sheets. 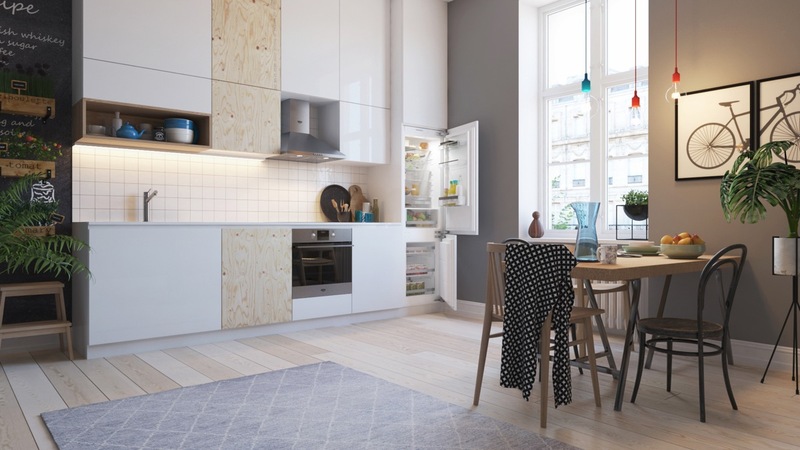 Doubling up the use of the cabinets like this is a particularly great idea for a small one wall kitchen layout since wall space is limited. Draw up the weekly menu, the kids after school class schedule, or just get creative with some temporary artwork. If your one available kitchen wall just isn’t long enough, look up. 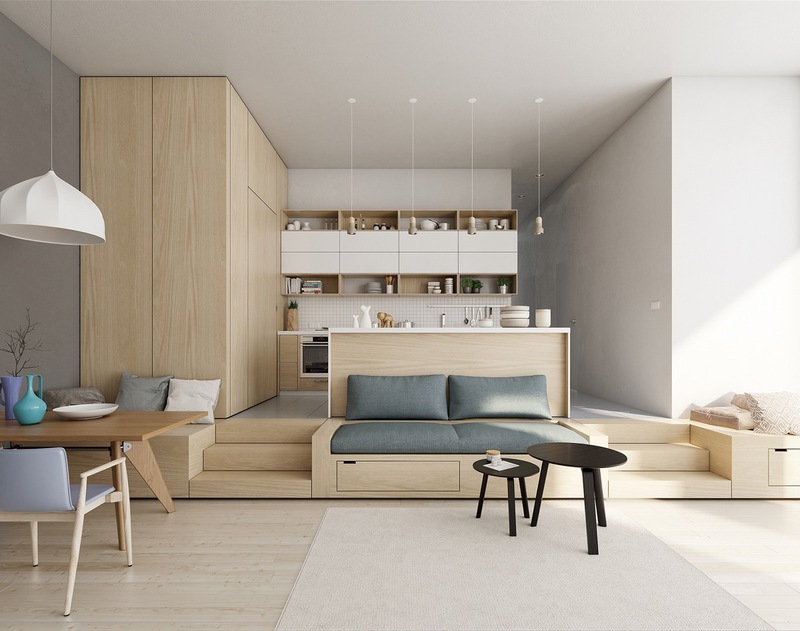 Make use of high ceilings by installing a double run of wall units to increase your storage space. The highest, less accessible units can be used for storing seasonal and occasional items. 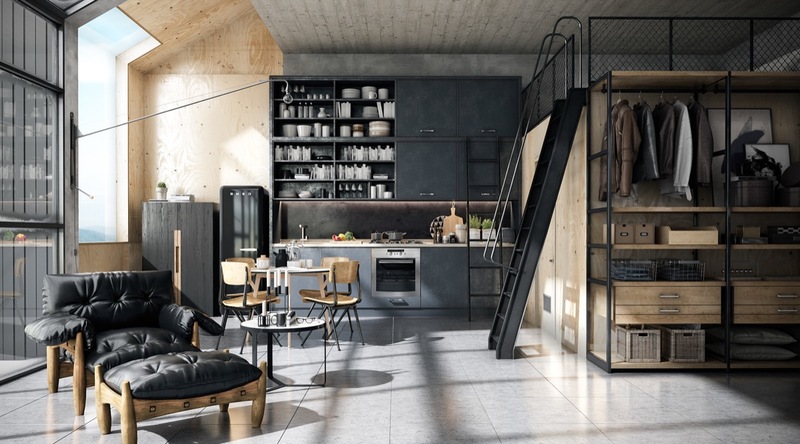 If you like the look of this space then check out these other industrial style kitchens. A plus point for a single wall of kitchen units is that the plumbing job is made much simpler with one straight run of pipework. 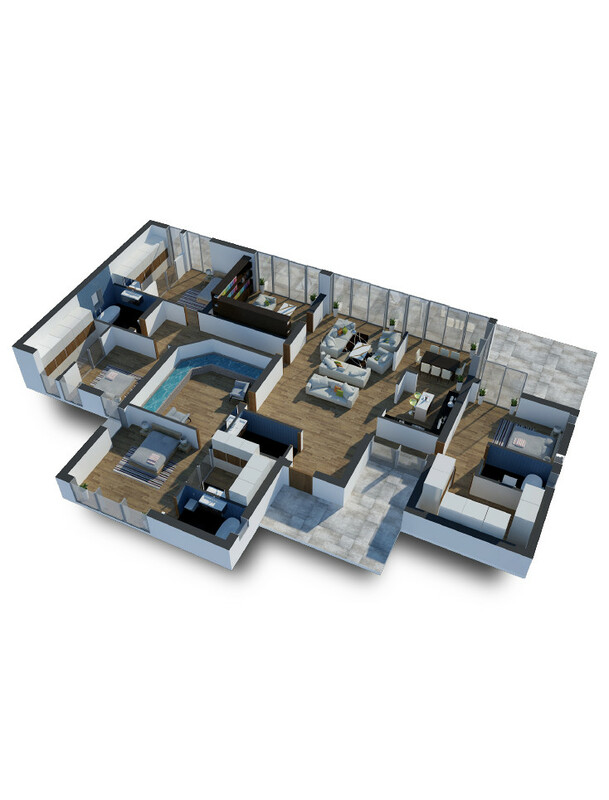 This apartment has the kitchen and bathroom vanity as one continuous arrangement for this reason. 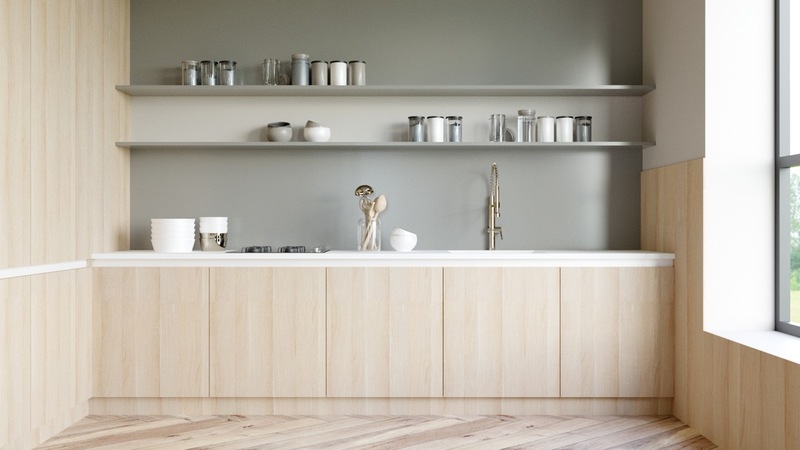 Open kitchen shelving can make a narrow space feel wider. Check out the way the kitchen shelves in this room create a unique divide in the backsplash. 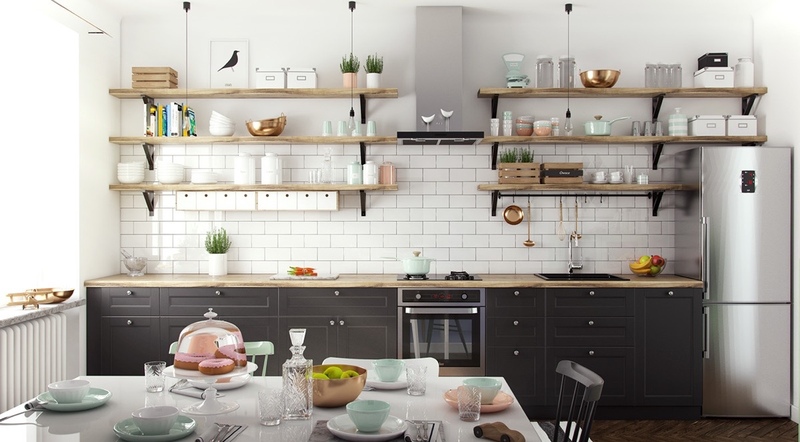 The shelves in this kitchen hold a hundred different items, from indoor herb planters and crates to storage boxes, crockery and mixing bowls. 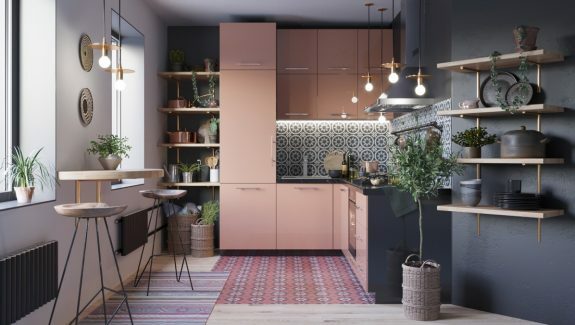 There is a lot on display here, but a cohesive look is achieved by only selecting items of a peach, mint, wood or white colourway. 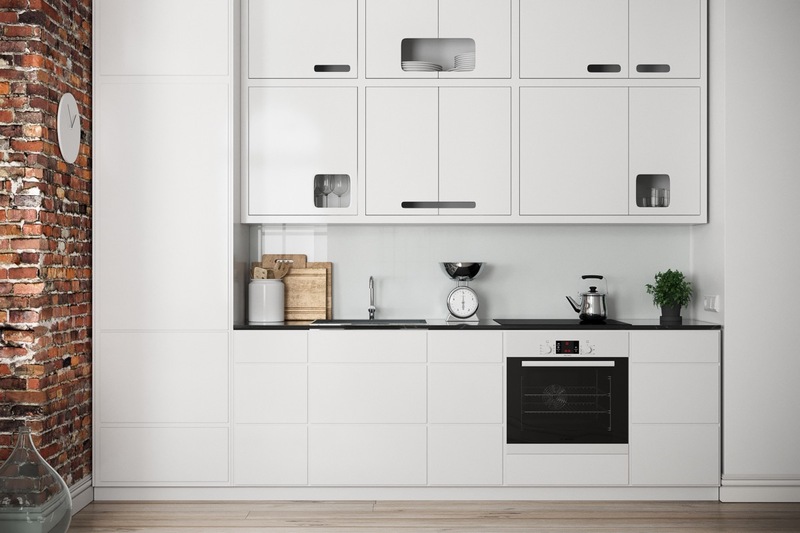 Break up a flat line of units with changing cabinet facias. 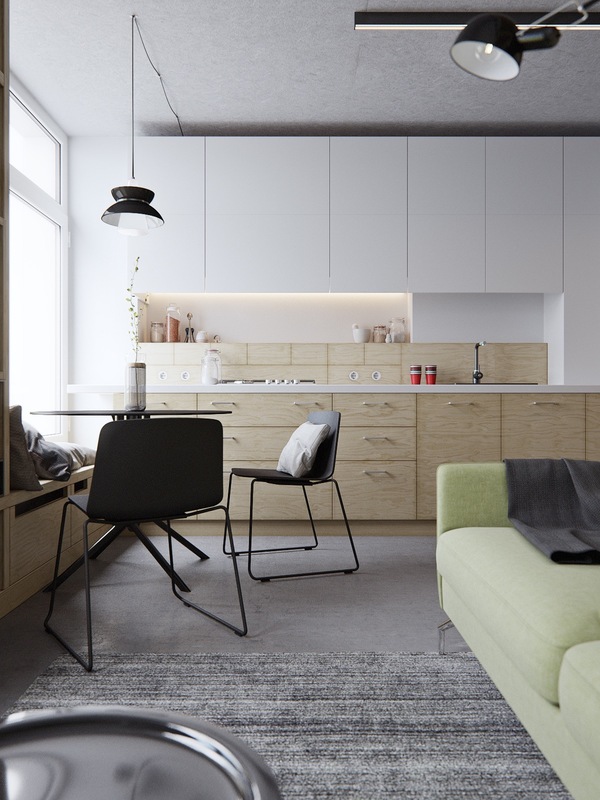 These wooden sections add bags of visual interest to slab fronted cabinets. Add a wow factor backsplash. 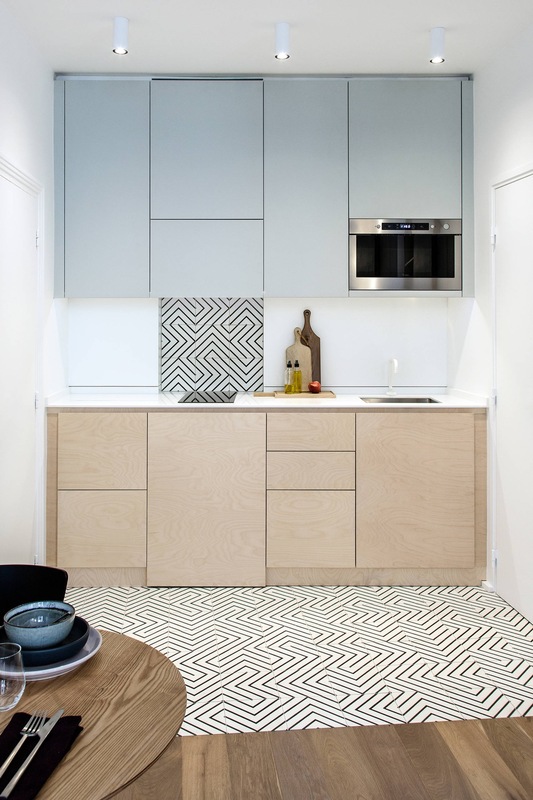 A plain run of cabinets can take on an entirely new personality when teamed with a highly patterned colourful backsplash. 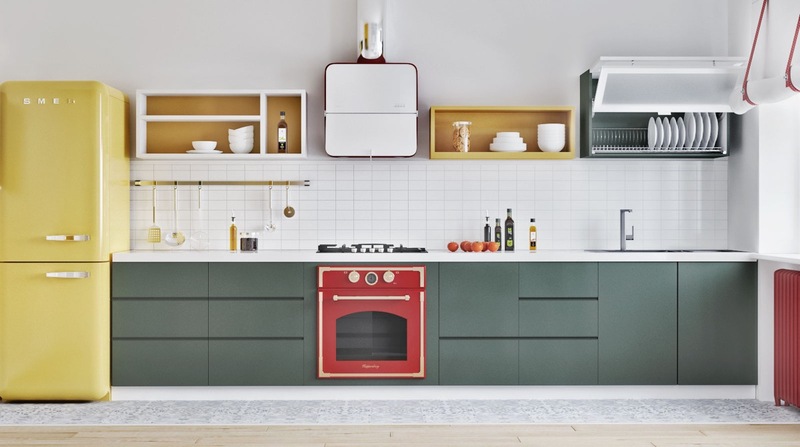 Compose a clash of colours with bold cabinets and appliances, like this combo of green units, red oven and yellow refrigerator. 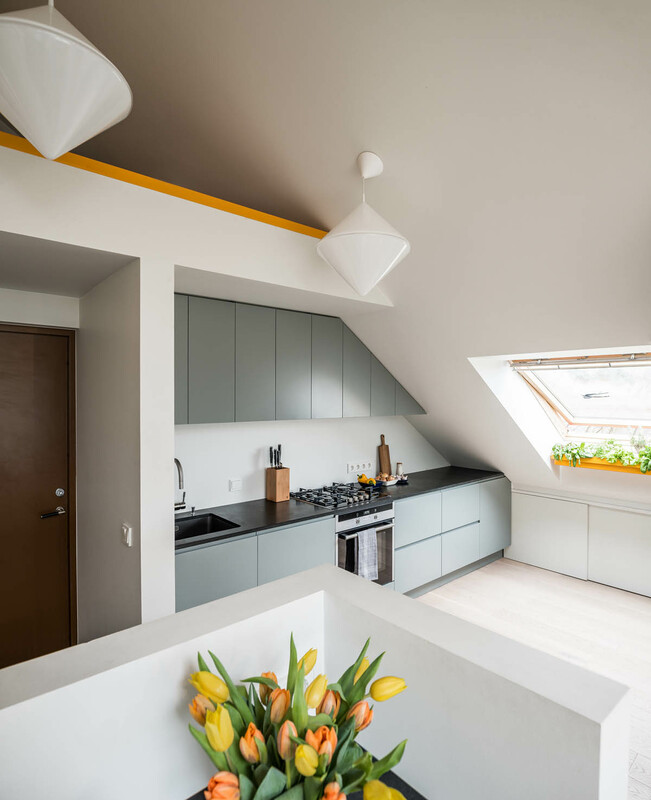 Fashion one solid colour block in the middle of your one wall kitchen to break the line. Add a border of matching colour. 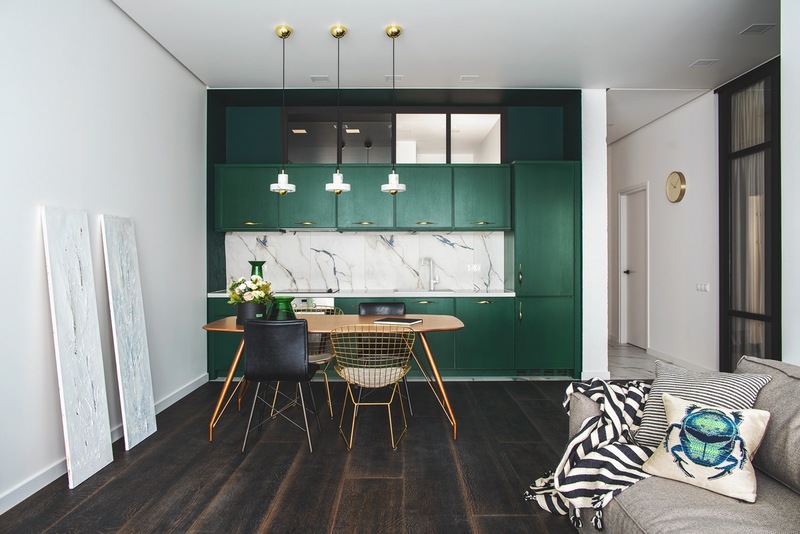 The wall behind this green kitchen is painted the same dark shade, and the paintwork extends along the side wall to line up with the depth of the units. 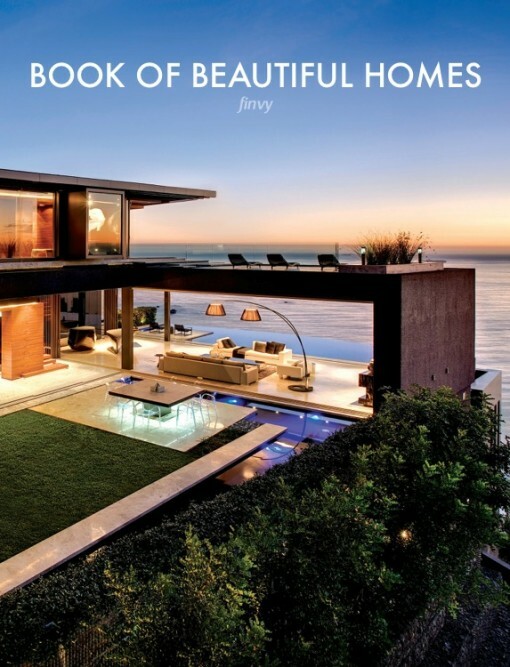 Find inspiration for a mixed colour scheme in nature. 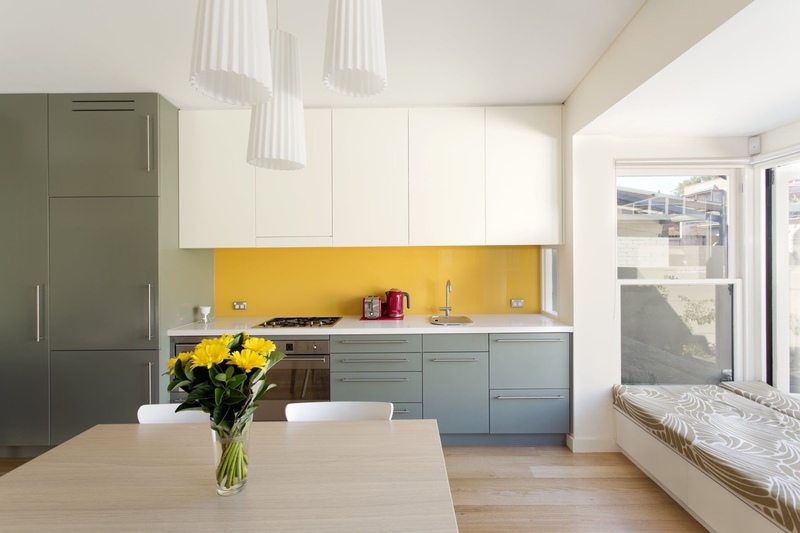 Muted green and blue cabinets meet an unexpected flash of vibrant yellow in this scheme – a colour palette surely inspired by a vista of frosty grass, wispy sky and morning sunshine. Use large areas of stark contrast to create high impact decor. 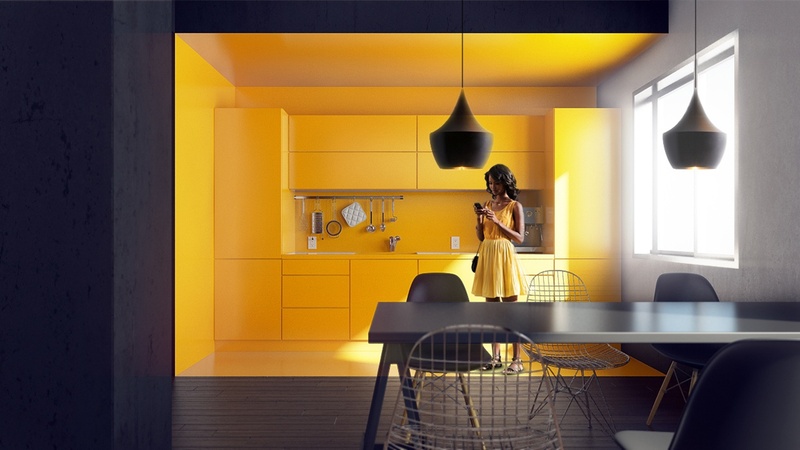 This solid yellow kitchen sits at the back of an entirely black dining room. If you can’t have an L-shaped kitchen, create an L-shaped design. 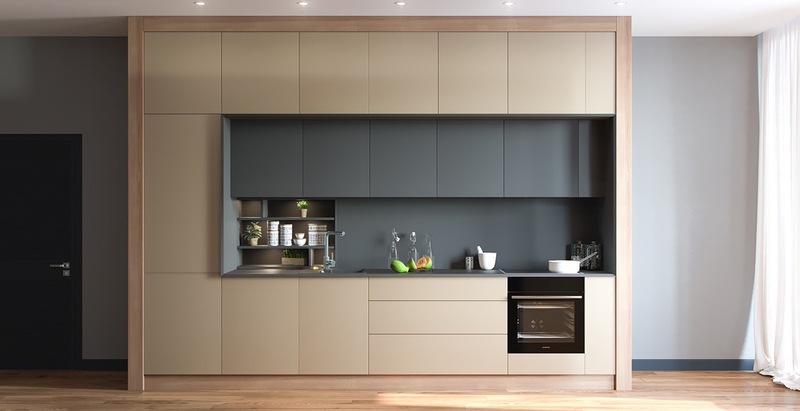 Knock back the look of wall units by selecting them in a dark colour, whilst arranging a tower of larder units and a horizon of base cabinets in a light finish. 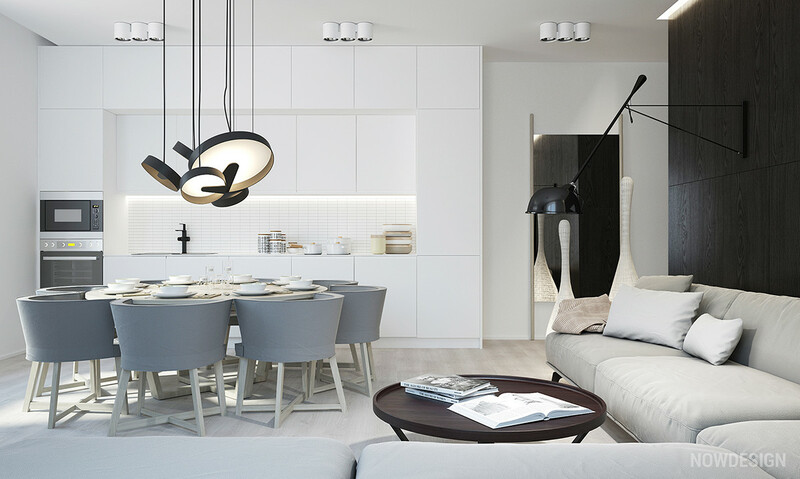 Unique kitchen pendant lights add glamour and curve to a straight design. 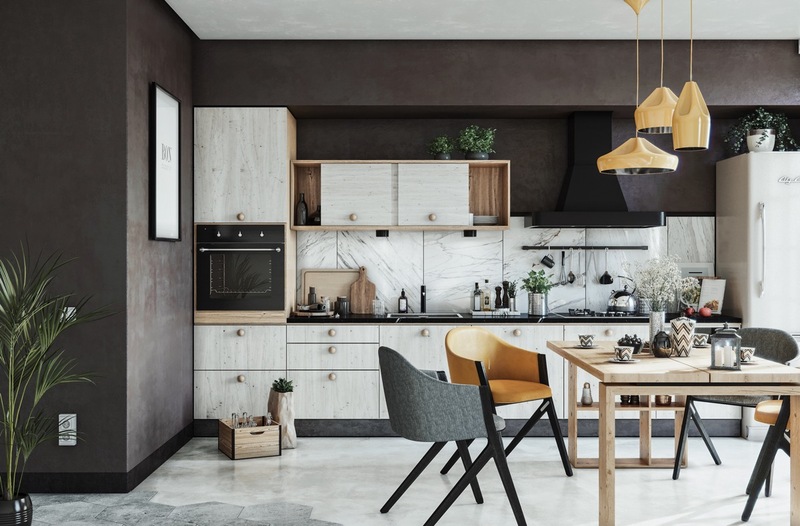 This one wall kitchen with island has the pendants suspended in the centre of the room, but you could use them in a similar way over a kitchen sink and prep area. 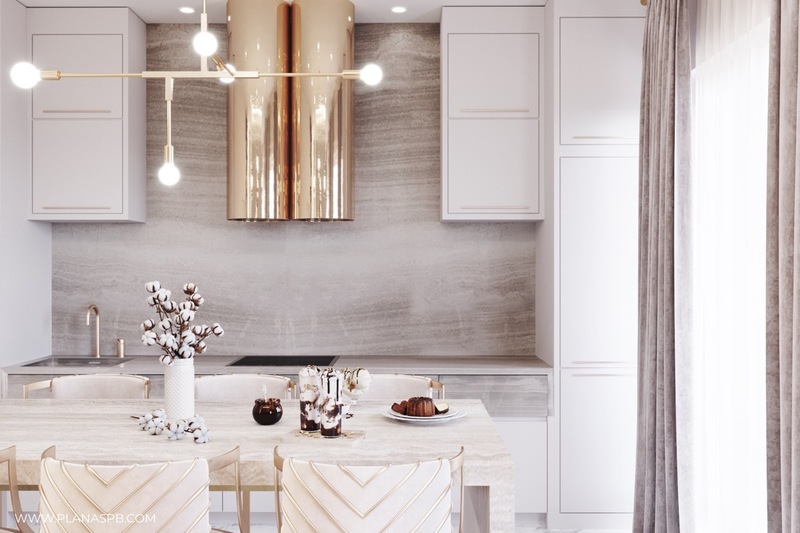 A breakfast bar can be created at the end of a single run of cabinets too, in lieu of a peninsula, by extending the countertop and adding a couple of kitchen bar stools. Add a little life. 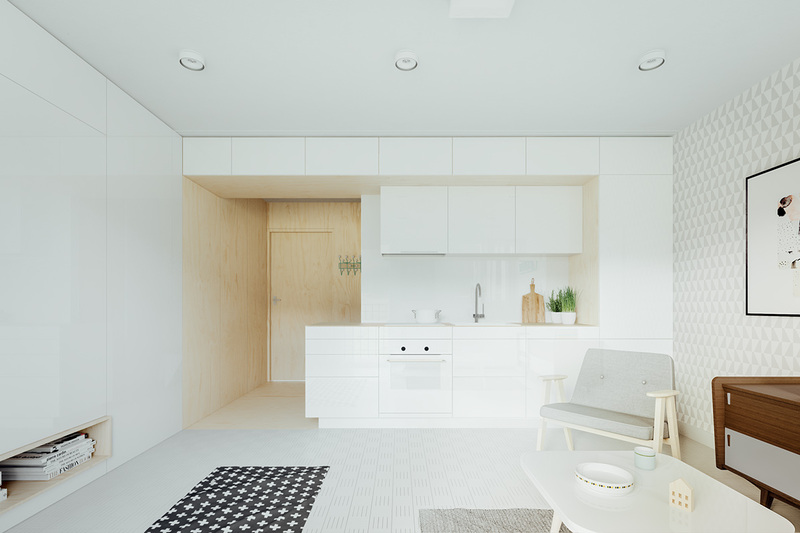 A white kitchen always looks clean and fresh but can be a little sterile. 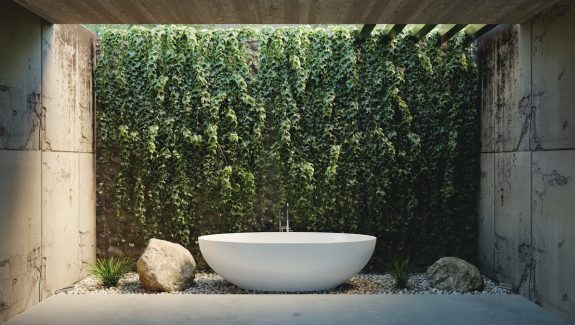 If jarring colour and pattern isn’t your thing, then how about a few indoor plants to liven things up. 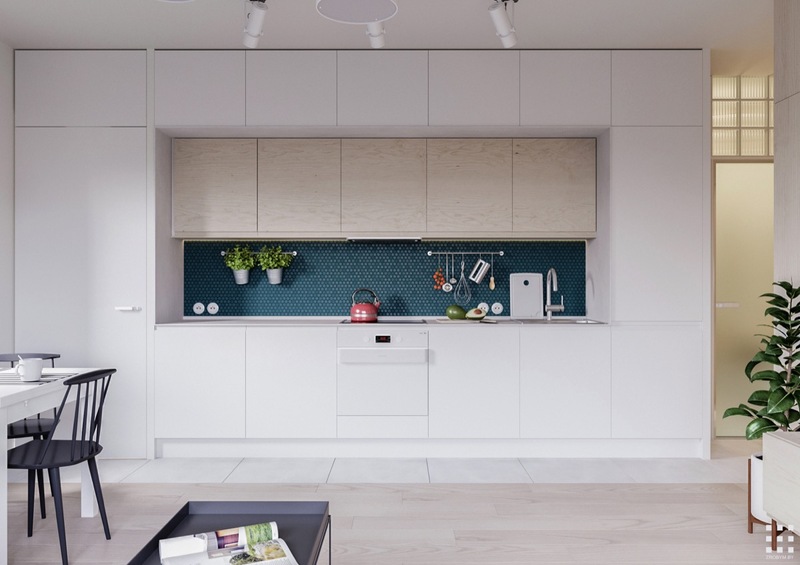 This minimalist kitchen disappears into the backdrop of an open plan living room. 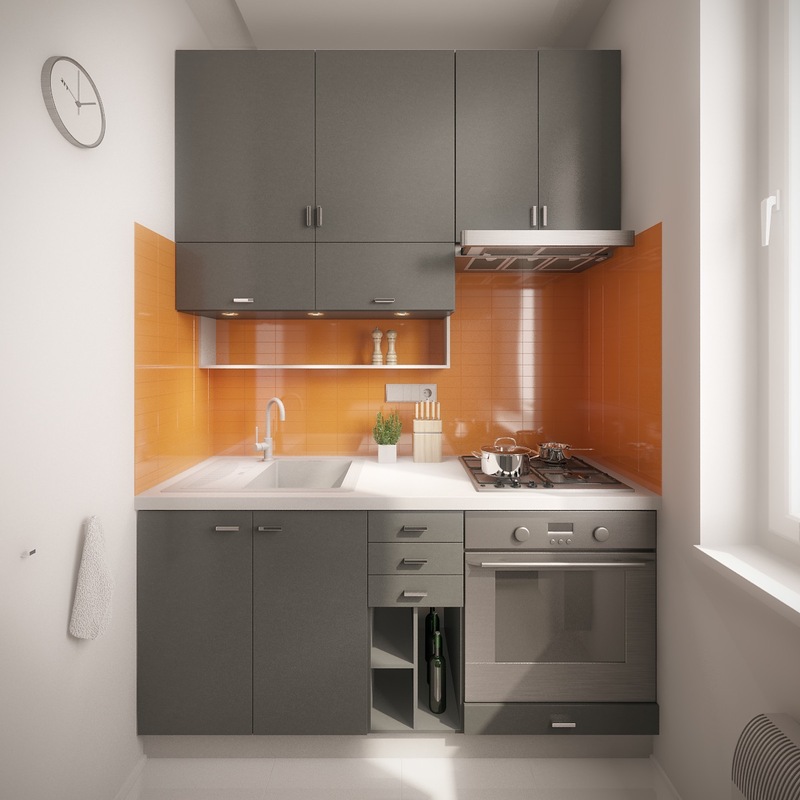 Camouflaging a kitchen with the decor can be beneficial in a very small space. 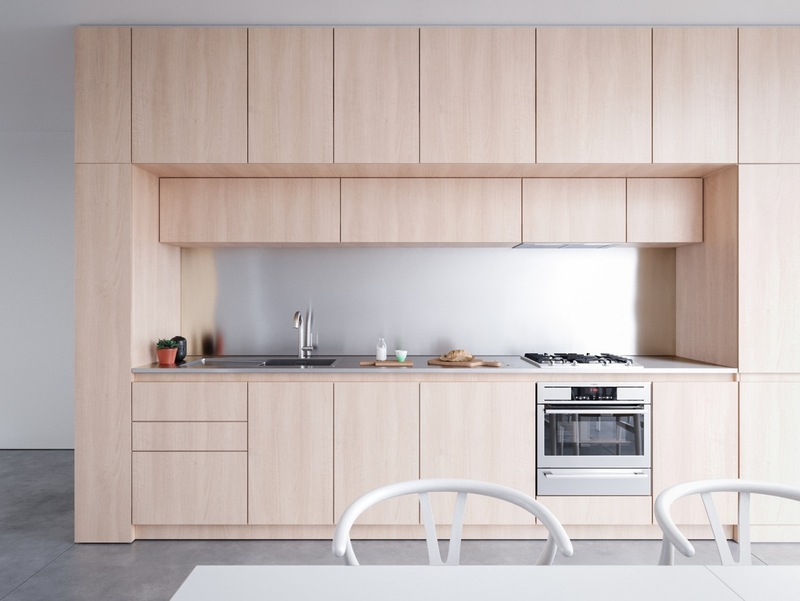 An outer framework holds a kitchen as a separate entity from the rest of the room. 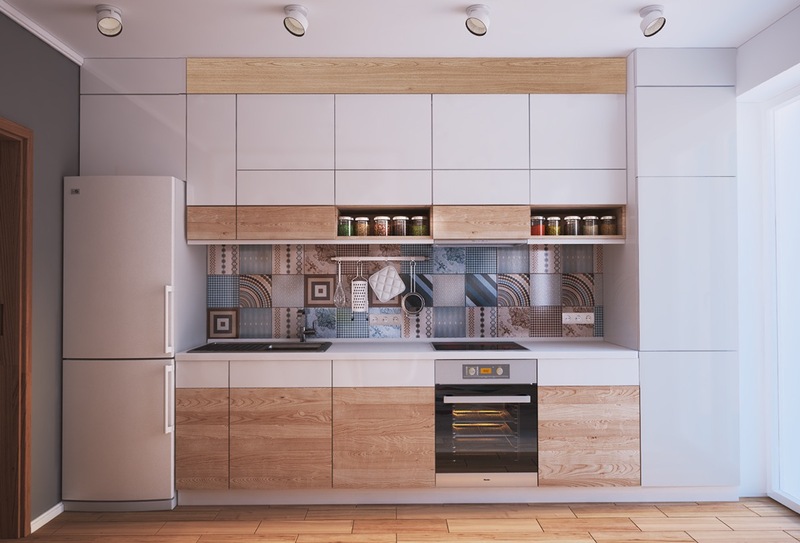 Use your kitchen to create a frame for your dining spot, like this symmetrical black and white kitchen design. 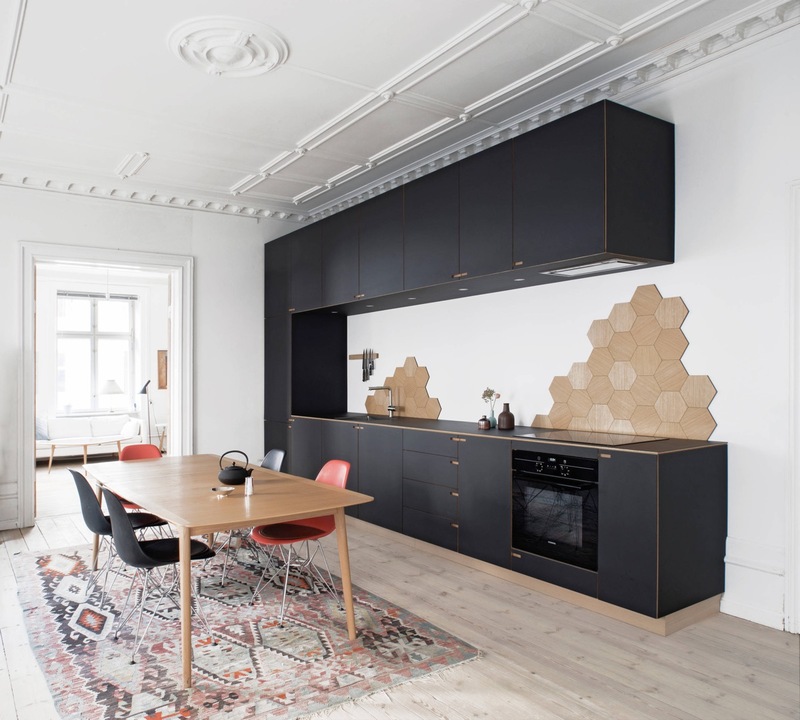 Another beautiful example of cabinet symmetry, this time in black and wood. 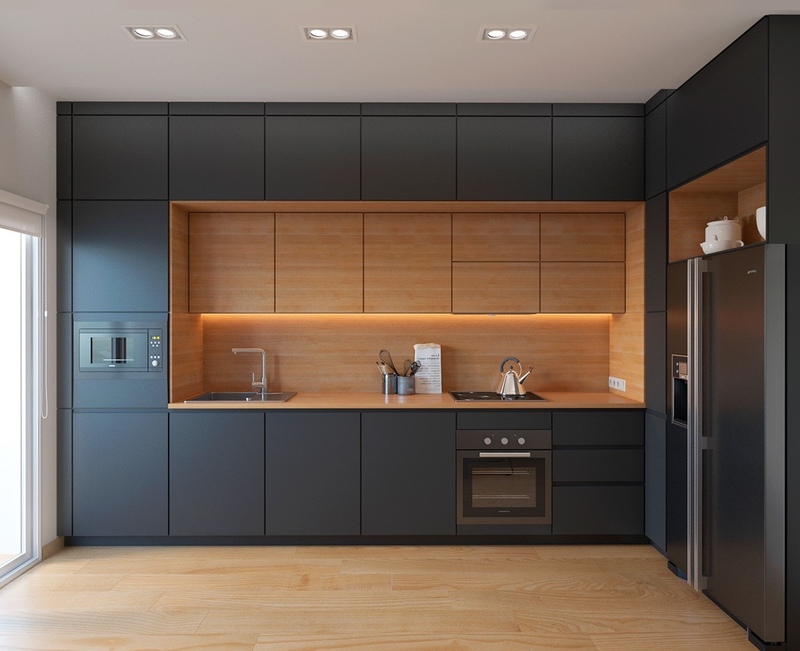 Although technically not a one wall kitchen, this subsequent black and wood kitchen design illustrates how the glow of a single strip light can crisply highlight a straight run. Shh, it’s a secret! If it wasn’t for the integrated oven, you could pass this row of cabinets and not know there was a kitchen there at all. Bifold doors retract to reveal a concealed grey kitchen complete with sink and hob. 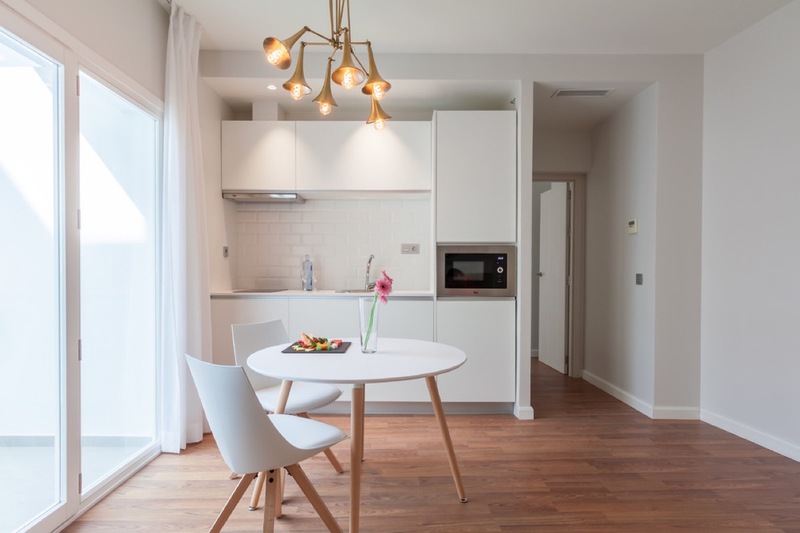 Lighting isn’t just for underneath cabinets, it can be used to create a welcoming glow along the top of units too. Hot zone your backsplashes. If you’re neat with your prep – ie. you don’t make a habit of splattering cake mix or smoothie juice up the wall – you could get away with just a couple of dedicated tiled areas around the stove and the sink. A smaller area of tiles means that you could opt for those high end, high price tag beauties you’ve had your eye on. Trolleys aren’t just for supermarkets. 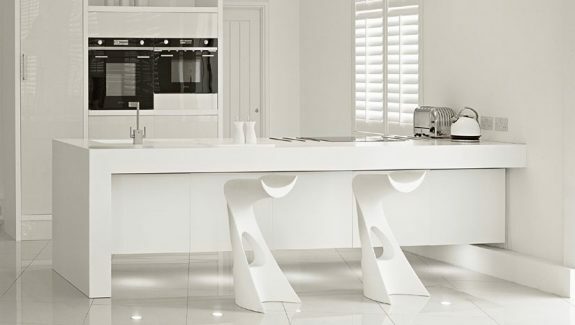 Increase your worktop area and storage by getting yourself a kitchen cart. Since they’re on wheels, you can easily move them around the room whenever and wherever needed. If you’re worktop is situated under the eaves like in this grey and white kitchen, don’t stop wall cabinets short of the slope. 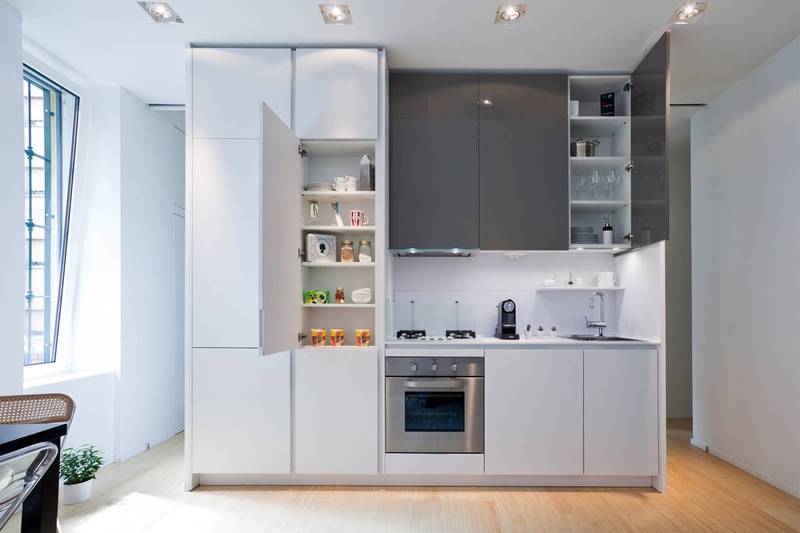 Consider having bespoke cabinets fitted right into the waning wall to maximise your storage space. 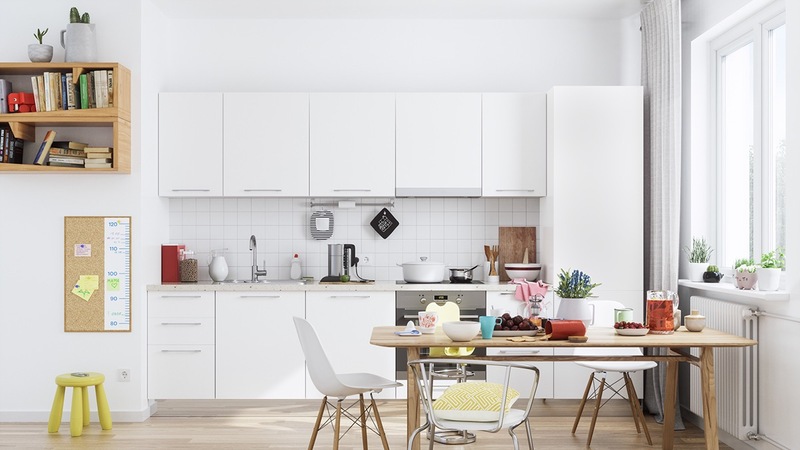 Downsize appliances in small kitchens. 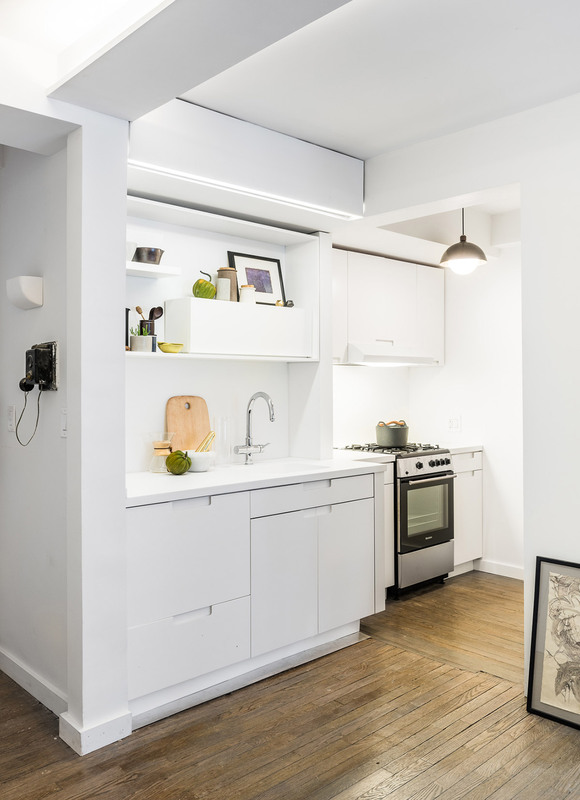 This tiny one wall kitchen has a half-size hob to free up more prep space on the countertop. Another kitchen with a half-size stove. Peekaboo! 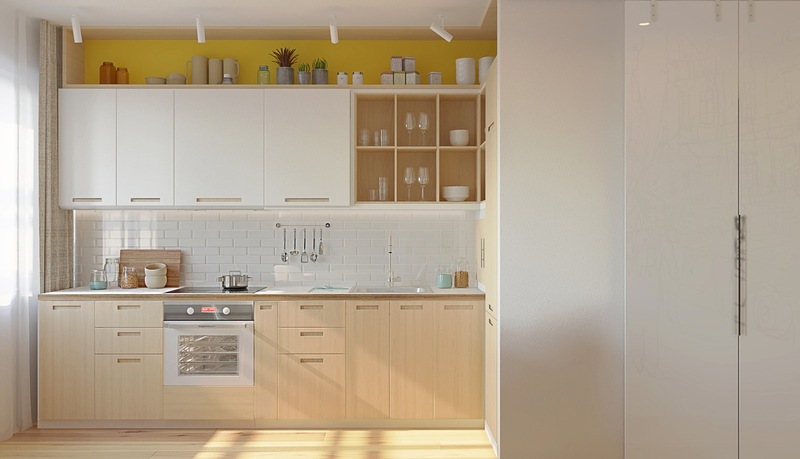 The cabinets in this modern kitchen have tiny windows cut into the doors – handy as a neat little reminder of the contents without putting the whole messy lot on show. Less is more. 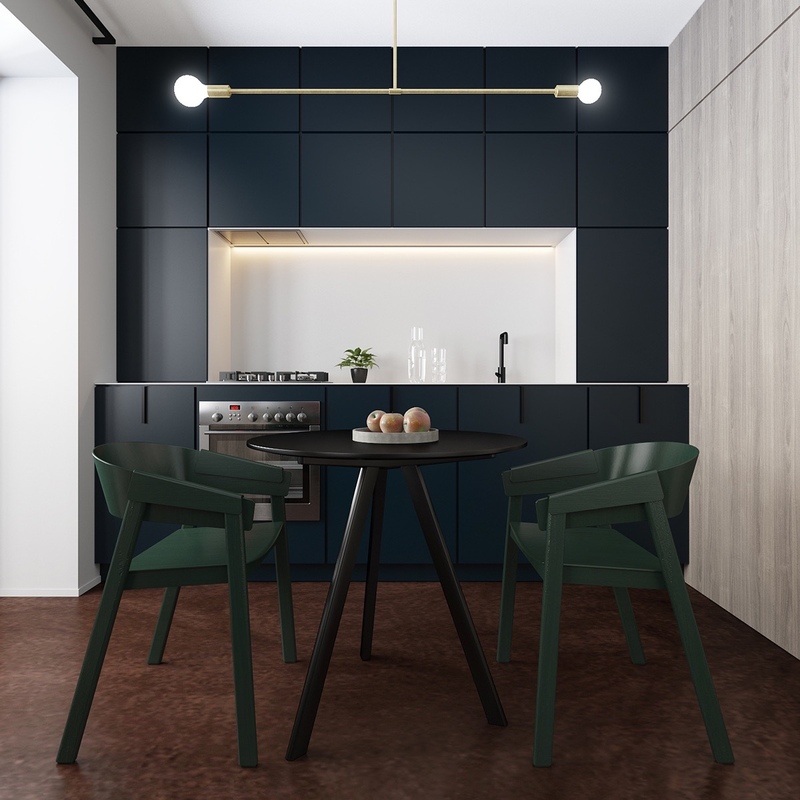 If you’ve fallen in love with a huge piece of statement lighting to hang over an accompanying dining area, then a plain wall cabinets could be the way to go. 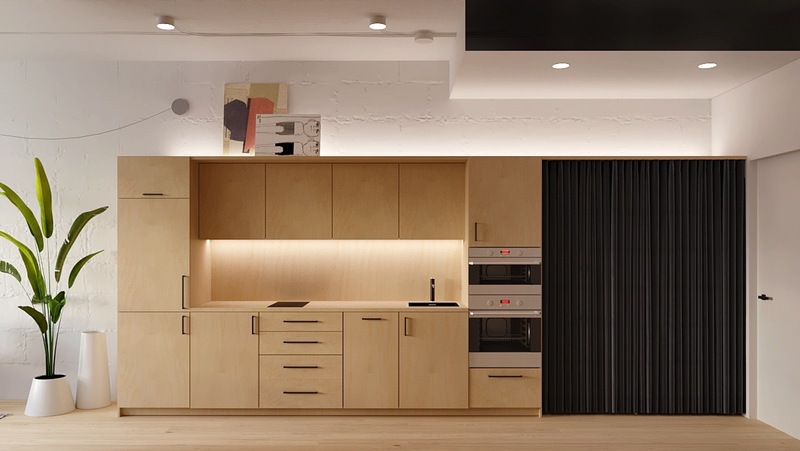 Louvre doors can add subtle interest to a plain white kitchen. 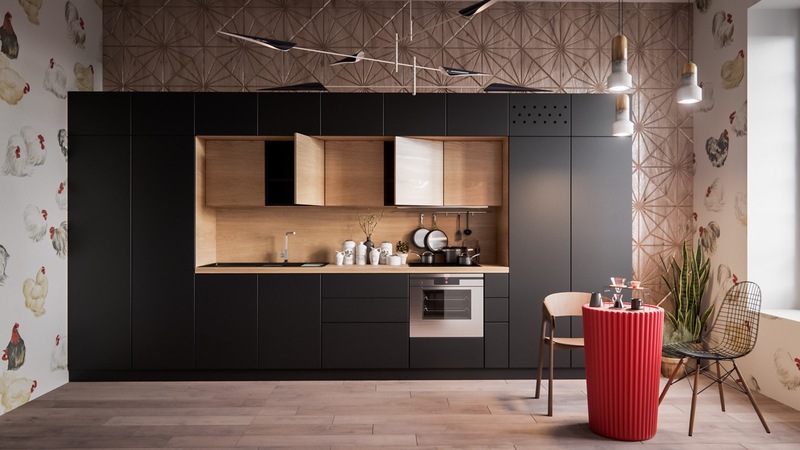 A contrasting black extractor hood makes a nice finishing touch too. 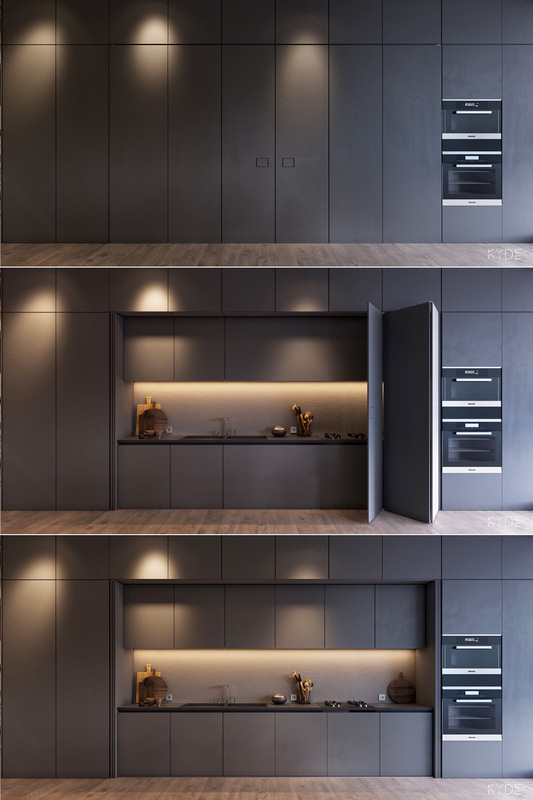 If taking wall cupboards and shelves up to lofty heights like in this towering black kitchen, you might want to keep a ladder at hand. 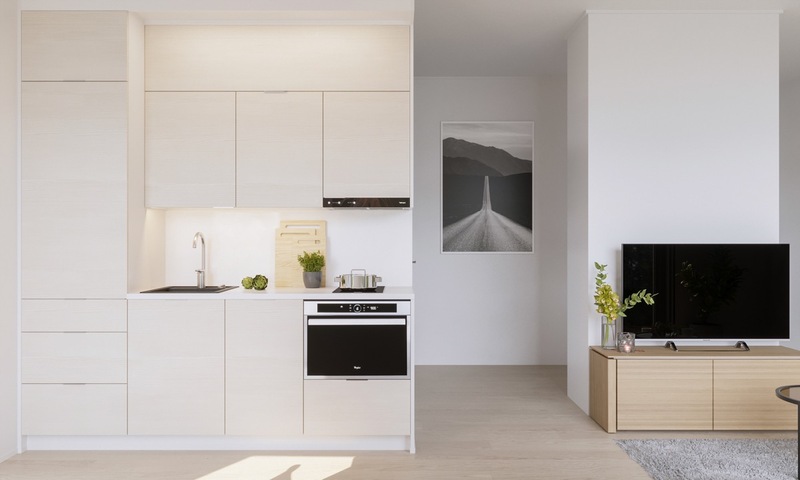 This bright and breezy Scandinavian style kitchen plays up to the copious amounts of natural light from a generous window. Add rustic charm with a Belfast sink. An integrated microwave saves bench space. 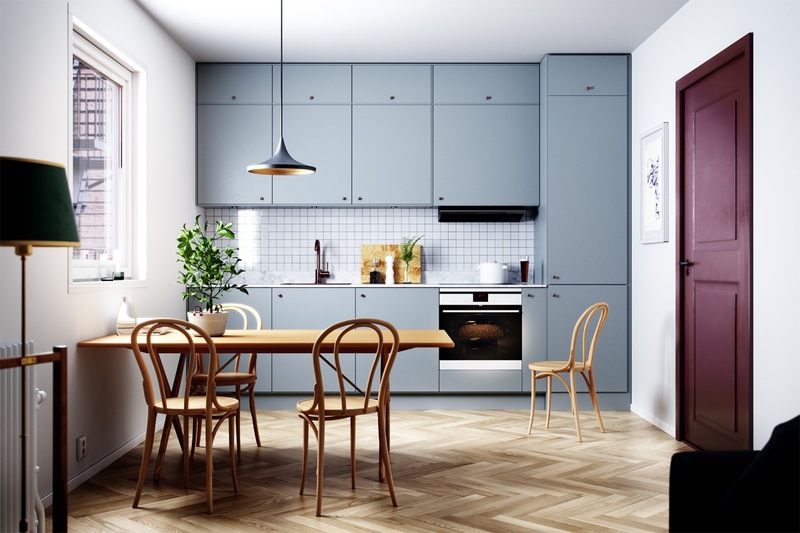 A wood dining set warms the look of this single wall blue kitchen. 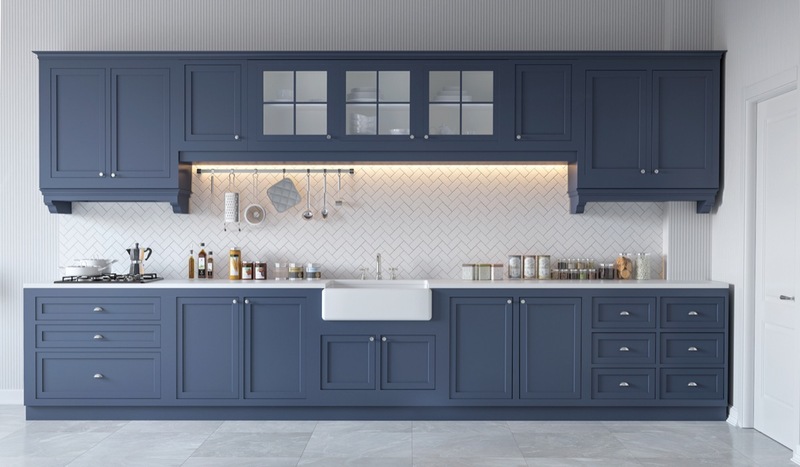 Wooden base cabinets make a calming combination with blue wall cabinets, even with an edgy tile addition. Use wood tone accessories to bridge the gap between, like wood cutting boards or a wooden fruit bowl. 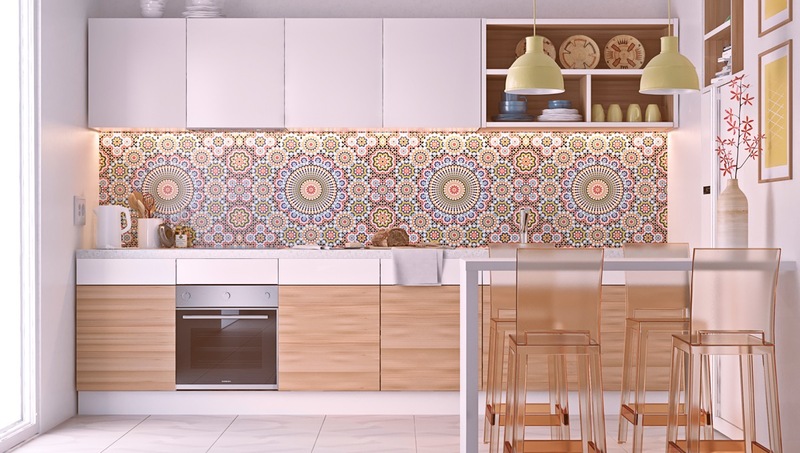 Install a unique kitchen backsplash to strike a stripe of colour across a straight layout. 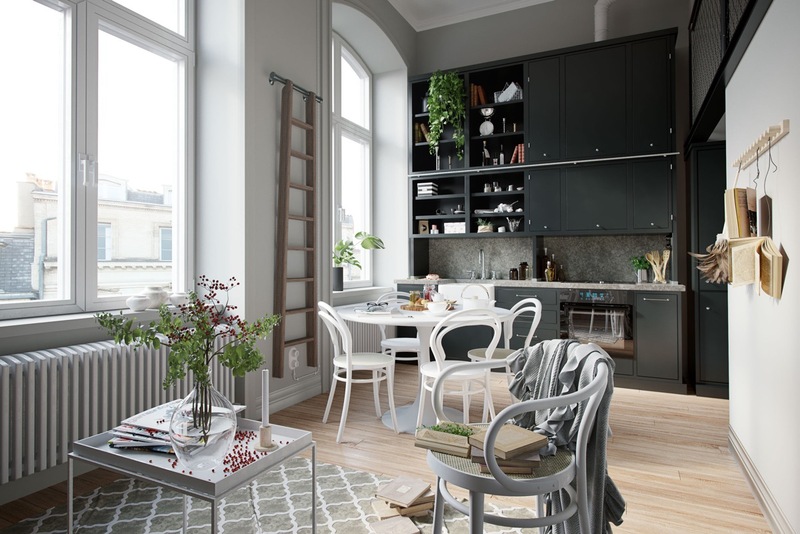 If you’re lucky enough to have a deep set window by your kitchen, then transforming the depth of the sill into a window seat can give a straight and narrow kitchen a more L-shaped appearance. Use the same material to create the bench as is used for the kitchen cabinets to make them link. The window seat can even become a banquette bench to increase the amount of seating at a small dining suite. A vertical stripe feature draws attention to an impressive ceiling height. Use an accent colour to paint the inside of a box shelf, or the space above the wall cabinets. Use tiles to colour things happy. Fashion a display case like this unusual little gallery box. Be playful with a two-tone arrangement. 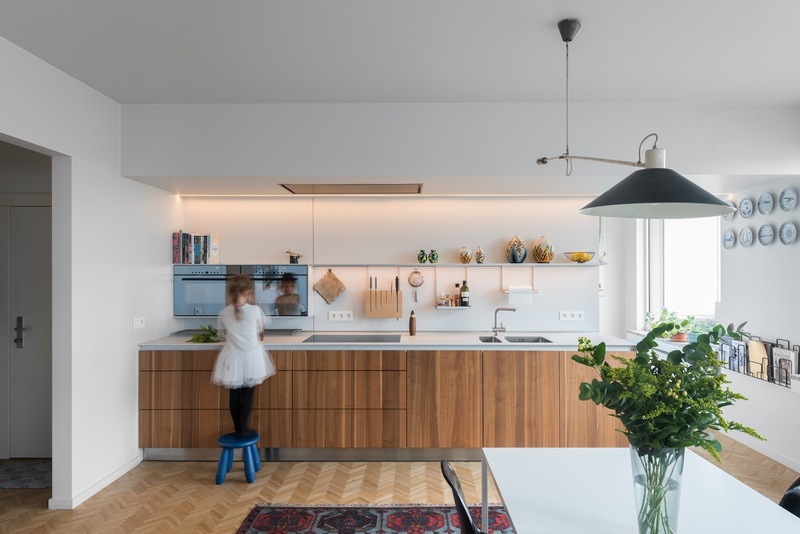 This elevated single wall kitchen with island uses horizontal volumes of wood and white to paint a pattern of stripes. Shine it up with a stainless steel backsplash. Go glamorous with gold on grey. Make a colour cluster. 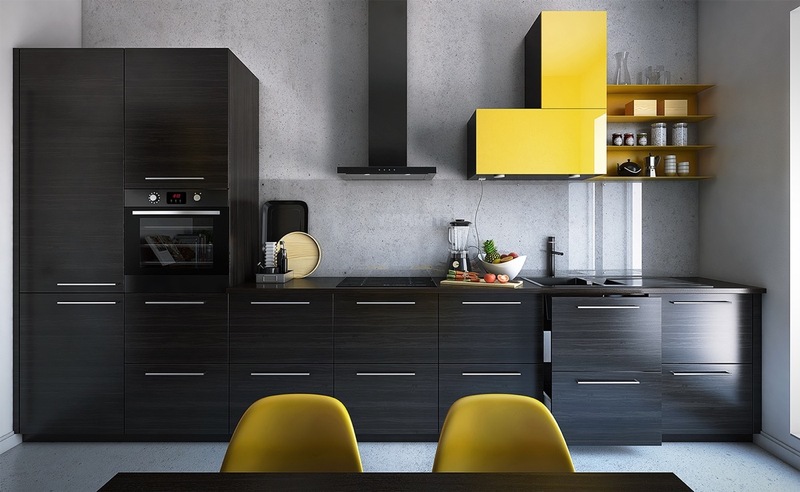 A grouping of yellow cabinets and shelves float an eye-catching cluster of colour over shadowy black wenge wood units. Like Russian nesting dolls? How about nesting cupboards? 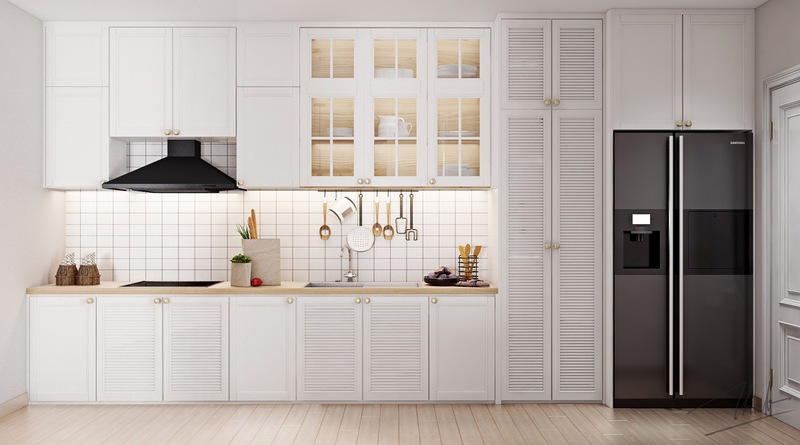 This arrangement of kitchen cabinets is set within a bigger installation of home storage units. Keep colours completely contrasting to properly separate the layers. Revel in all that is rustic. 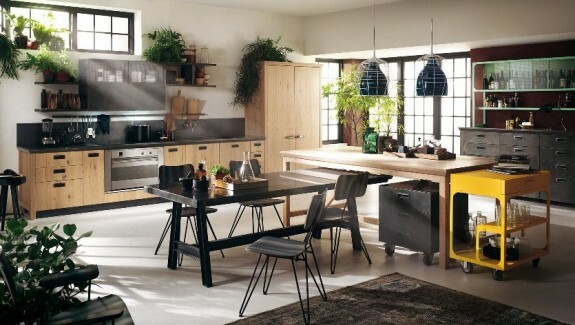 This modern rustic kitchen uses a combination of wood tones to achieve an interesting layered look. Raw wood grain peeps out from open fronted cabinets and around side panels, whilst grey wood tone spans all of the doors. 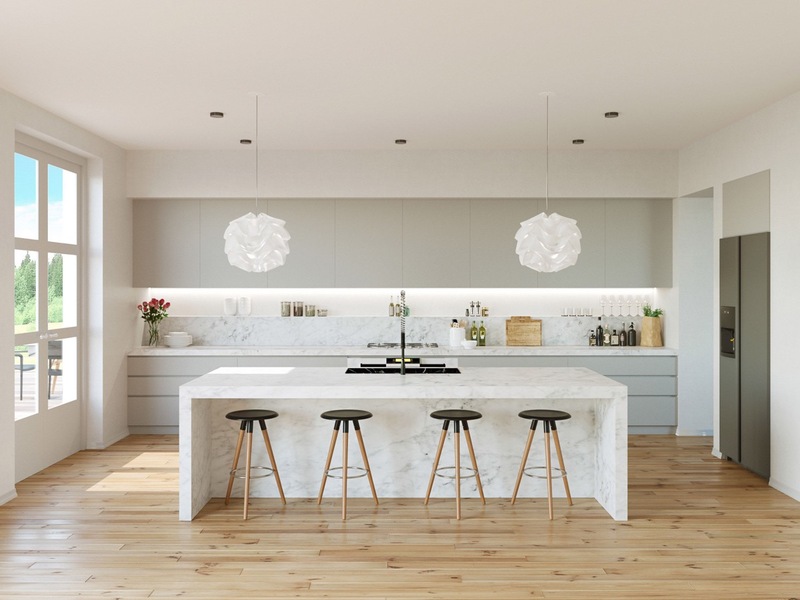 Grey veined marble tiles follow suit along the backsplash, and raw concrete washes over the floor.